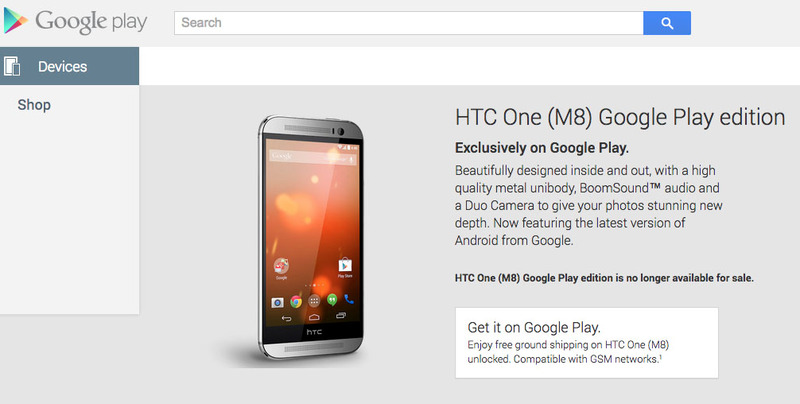 The HTC One (M8) Google Play Edition, the last remaining Google Play Edition device, is no longer for sale. In fact, the device isn’t even listed under the “Phones & Tablets” tab on Google Play; you need a direct link in order to see it. Not that this change is much of a surprise, since the new HTC flagship is around the corner, but it’s sort of sad to see, because this could be the end of the Google Play Edition line of devices. For months, we expected a Galaxy S5 Google Play Edition to arrive – even Google thought it was coming – but it never did surface officially. So as the rest of the line (Moto G, Z Ultra, G Pad 8.3, and Galaxy S4) has disappeared 1-by-1, we kept wondering if something new would pop up or if Google would slowly let the brand die. I would guess that GPE is dead. But hey, at least the One (M8) GPE just got that hot Lollipop action! A nice little send off, for sure.